Perhaps the happiest weather of all time is Monsoons, which is exactly why we feel happy, cheerful and colorful in this season. The nature is at its best, bestowing upon us its green bounty, hours of drizzles and chilling fog. Most of us, hang out with friends, visit new destinations, try new savories, and sinfully indulge in eating and shopping sprees in these months. Monsoons bring with them an eclectic freshness which is too contagious! It spreads happiness like fire. Inspite of being loaded with our busy schedules, we give in to those moments of laziness and enjoy a hot cup of lemongrass tea watching the rain droplets slide down the window. We want to sing, we want to dance, we want to experiment, we want to push our boundaries, we want to discover ourselves, there is so much we want to do all the time. As adults we can choose to do any of these anytime we wish. But have we ever thought of opening up the gates for our younger ones??? Imagine seeding the idea of self discovery and contentment in the raw, untamed brains?? 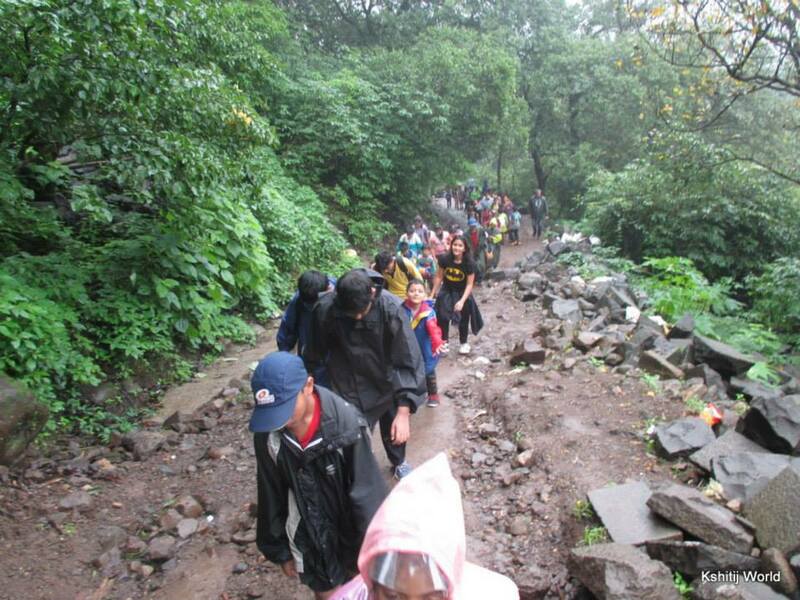 Kshitij World, a social organization from Mumbai attempted to do the same in July 2014, over three treks to Lohagad, Lonavala with almost 120 kids, as a part of their annual program called as the Kids Club. 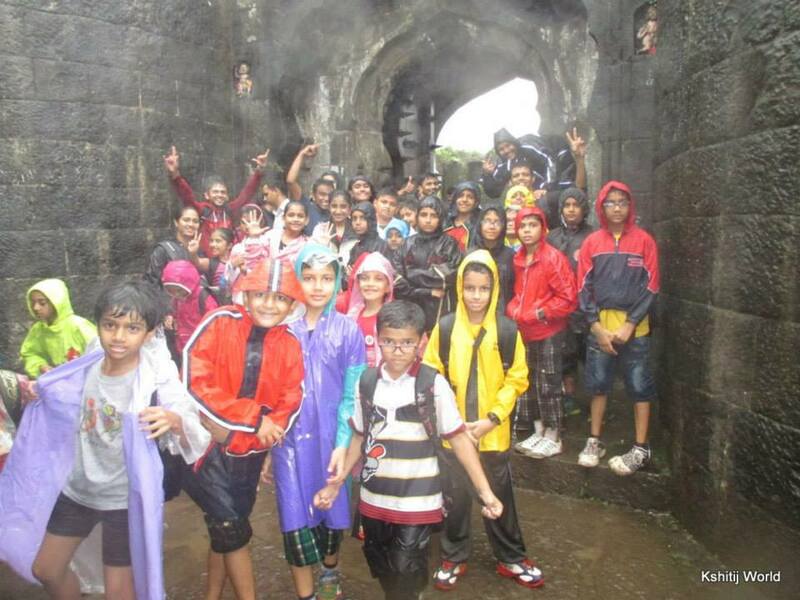 Kids aged seven to fourteen from all over Mumbai participated in the trek. The kids left Mumbai by 6:45 in the morning, on their official day of rest! Looking adorable in their brightly colored rainy wears, shoes and have-a-sacks, they looked ready for a mission. The banter never ceased all through the bus journey, but the kids were disappointed at the early morning traffic on the expressway. The weather favored them with loads of rain and scenic beauty all around, but the never ending expanse of cars seemed to go on forever. The mad race to reach Lonavala and Khandala for the weekend seems to have gripped the Mumbaikar’s pretty tight! Munching on their sandwiches and singing songs all along the way lightened the long hours it took to reach the base village. Lohagad, situated at a height of 3389 feet from the sea level, is known for its Strength and Sturdy appearance. Various dynasties have ruled the fort right from Satavahanas, Chalukyas, Rashtrakutas, Yadavas, Bahamanis, Nizams, Mughals and Marathas. Lohagad is one of the best trekking locations for first timers. 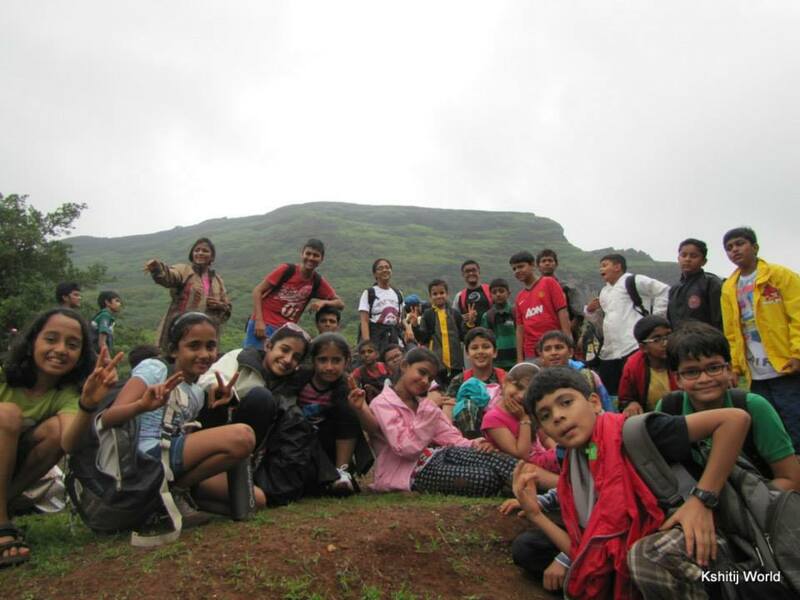 Lohagad is quite near Mumbai and Pune both, thus causing a great deal of public attraction for families and youth. The kids reached base village and halted for some tea and coffee break. Plenty of small waterfalls invited people to have fun, thus leading to a lot of crowd at the base. Several cars and traveler vehicles made it difficult to progress further in the bus, so the kids had to start walking quite before the regular start point. What a pleasant sight it was to witness a huge troop of 40 kids at one go, stand in a queue and start footing the mighty mountains of the western ghats. Rains and red soil, slippery pathways, dense bushes guarding the tracks and rains blurring the view in the front added to the thrill and excitement. Organizers had divided the trek into 5 stages and the flag on the fort was the final accomplishment. The curiosity of the kids knew no bounds so as to what was up there on the fort, how many kilometers was the trek, why was the fort built , and the constant question – how long would it take to reach to the top etc??? It pained to see the younger generation, physically challenged! Not in the literal sense, but imagine an 8 year old boy complaining of leg pain after 10 minutes of hiking isn’t really, rather shouldn’t be acceptable! Girls squeaking at the sight of their branded shoes getting drenched in mud and requesting to wash them with the only drinking water they had !!! It was just astonishing to think, has easy access of every basic necessity pushed us away from basic life skills??? Certainly kids aren’t to be blamed, they are kids after all ! Nonetheless, the kids showed their true spirits and abided by their instructor’s constant motivation and encouragement. Inspite of the arduous walk uphill, the kids completed the climb in three hours, some falling , some getting dirty and some panting! The beauty of the hike was constant and ever increasing. Far away from the worries of their homework and tuition’s, the kids slowly began to loosen up and savour the pleasure of walking amidst nature. For them, it was the first experience in wilderness. They never knew places like these existed. They never knew they could push themselves so hard to achieve a goal ! The rays of hope on their faces on seeing the fort nearing , was an expression to die for ! They learnt to share their space, water and food ! They learnt to help each other, they learnt to trust others! They cared for their partners. They learnt to let go! The kids fabulously marched through mossed stones and cold rivulets, dodged water falls and balanced on uneven rocks! Nature came to rescue and all the stored energy came to power. After reaching the highest point, a sense of victory overshadowed their tired bodies and hungry stomachs! Their faces glowed in the happiness of their first conquer! The chilly winds and razor blade rains couldn’t dampen their mighty spirits. Shivering with cold, they posed lovingly for photographs, eager to tell the tales to their mothers! A pure moment of bliss, a walk through the rains, a walk through the wild, a walk to remember and memories to cherish for years to come! Does the journey end here??? No, absolutely not…. It’s the beginning of the Travel for them. It’s the beginning of self discovery and learning. No one teaches as better as Nature. These kids were lucky to get to put their first step forward at a very tender age. It’s never too late to begin to travel and take that quintessential walk in the rain. Get up and get started. Monsoons will accompany you!